1. BareMinerals Eyelid Primer - I don't know why I haven't tried an eyelid primer before, but I am hooked. My eyelids are veiny, and my eyeshadow never stays put throughout the day. 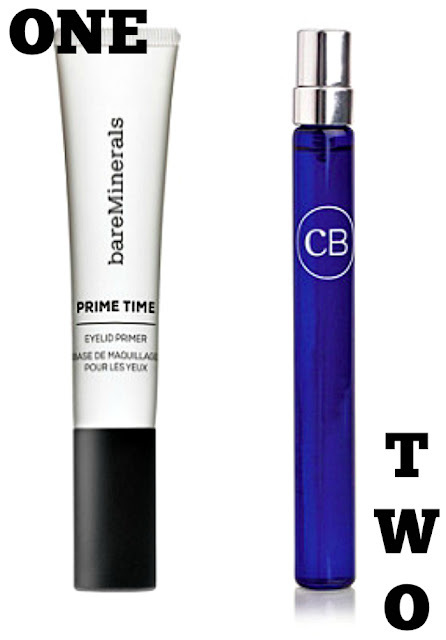 It makes complete sense that an eyelid primer would be the perfect solution, and it is! There are lots out there, and in varying price ranges, but I like this one from BareMinerals the best for its complete and long-lasting coverage. 2. Capri Blue Volcano Eau de Parfum Rollerball - If you are fan of Capri Blue Volcano candles, you'll equally love the rollerball perfume. I received a sample of this and was immediately hooked. This purse-sized bottle is perfect for travel as well and has the subtle scent of tropical fruit and citrus...perfect scent for the upcoming summer season. 3. 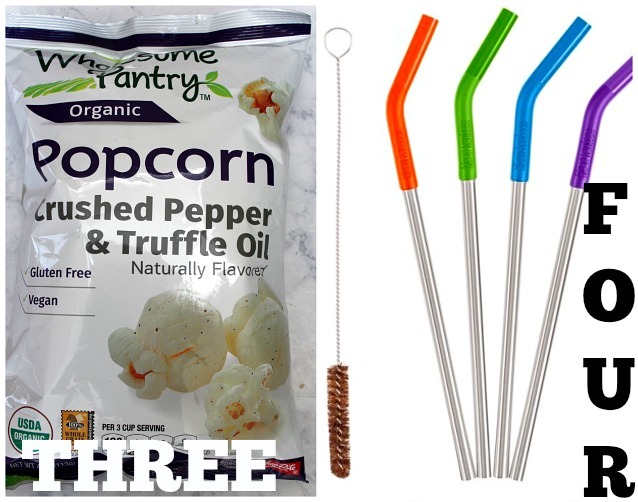 Wholesome Pantry Crushed Pepper & Truffle Oil Popcorn - I'm a big snacker. I like to graze, picking at snacks all day long. Since I tend to pick throughout the day, I make every effort to choose healthy snacks. Shoprite recently sent me a package to sample its Wholesome Pantry line of products (read more about the items I received here). This popcorn was included in the package, and I am obsessed. It is soooo delicious. Tons of flavor, and since I happen to be a big fan of pepper on popcorn, this flavor combination couldn't be a better match for me. 4. Reusable Steel Straws - In an effort to reduce my carbon footprint, I bought these reusable straws. I never know what to do with plastic straws. Are they recyclable? Should I throw them away where they will sit in a landfill for years and years? The decision literally pains me. Rather than struggle with that decision, I invested in this 4-pack of steel straws (comes with a cleaning brush as well). They are fantastic!! I carry them with me, and whenever I go to Starbucks (or anywhere), I skip the plastic straws and use a steel straw instead. 5. 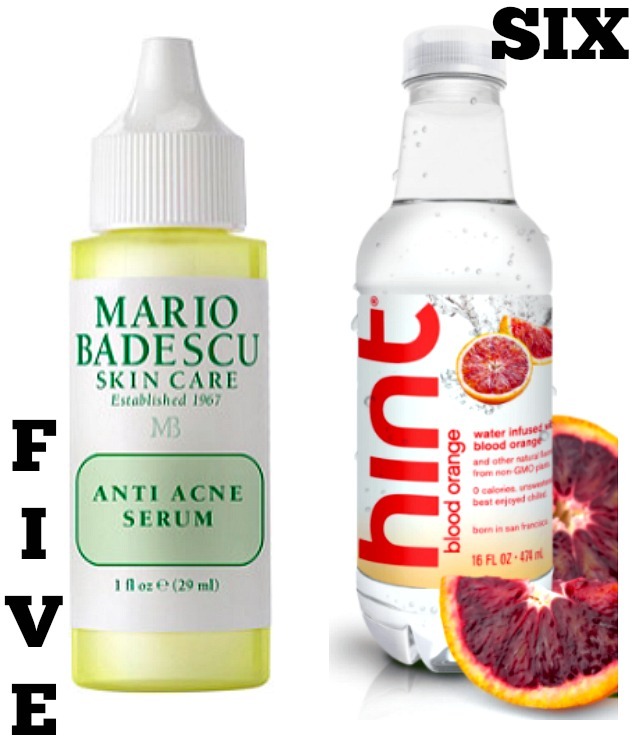 Mario Badescu Anti Acne Serum - I swear by Mario Badescu skincare products. I've been buying them for years, and its one of the only brand loyalties I have. I bought this serum on a whim at Ulta this week, and it performs miracles. You can apply it all over your face to prevent acne or you can apply it directly to a spot to clear it up. I find it to be super effective when it's used in combination with another one of my favorites: Mario Badescu Drying Lotion. 6. Hint Water, Blood Orange - I've had a long love affair with Diet Coke. I don't drink it often, but there are times when only a Diet Coke will do (like with pizza). I'm trying to reach for an alternative that still has a hearty amount of flavor but has more redeeming qualities in terms of nutritional value. Hint Water has been doing the trick. I haven't tried all the flavors, but I am seriously enjoying the blood orange and pomegranate flavors.